“If music be the food of love, play on,” wrote Shakespeare in Twelfth Night. We can’t help you with the music (we trust you do your own mixing), but in the romance food department we have you covered. No stressed out servers. No long wait for cocktails. And the best table in the house is yours. Speaking of cocktails, get things started with a fired up Old-Fashioned: For each drink, crust a slice of orange with sugar and grill over a hot fire until the sugar caramelizes, 2 minutes per side. Put a sugar cube and a splash of water in an Old-Fashioned glass (a short tumbler) along with a couple of drops of bitters. (I like Fee Brothers.) Stir to dissolve the sugar, then add ice and 2 ounces of bourbon or rye whiskey. Stir again. Garnish with a maraschino cherry and a grilled orange wedge. Next up, oysters, whose aphrodisiacal powers have been acknowledged for centuries. The Casanova (who by his own tally seduced 122 women) breakfasted on 50 a day. Oysters’ libido-enhancing properties were confirmed a few years ago by a team of American and Italian scientists: They discovered oysters contain two rare performance-boosting amino acids as well as zinc. Sure, you could eat them raw, but we like ours romanced with tequila, barbecue sauce and pepper Jack cheese and sizzled over a hot fire. 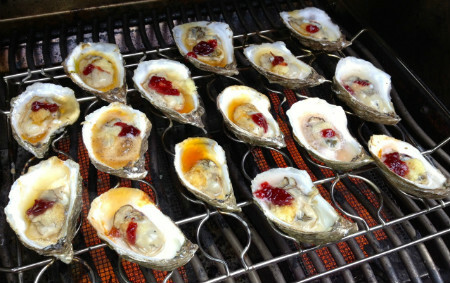 Get the recipe for Drunken Sailors (Barbecued Oysters). 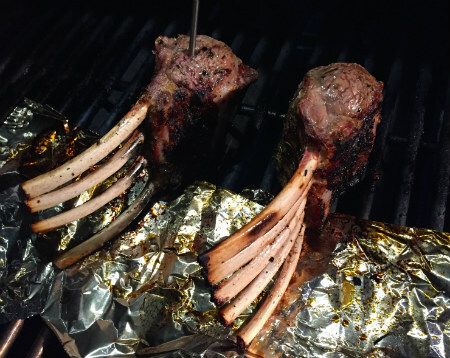 Next up, rack of lamb. I like to think of it as prime rib for two. Seared on the outside and rosy in the center, it’s delicate and meaty. And you get to pick it up with your fingers. The salad (served French-style—after the lamb) plays a theme of hearts (artichoke hearts, celery hearts, and hearts of palm). You smoke them with a Smoking Gun, and yes, you can do it ahead. No permit to carry? No problem. Simply smoke the vegetable hearts in a disposable foil pan on your smoker or grill. For dessert, you want something soft, sensuous, creamy, luscious, and rich. Crème brulee fits the bill, and there’s high drama when you caramelize the sugar with a fire-heated crème brulee iron (or blowtorch). 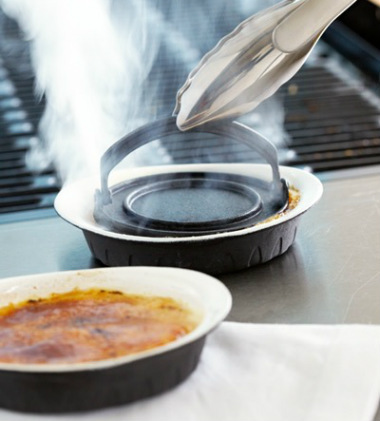 Get the recipe for Smoked Crème Brulee. We can’t promise this menu will guarantee you a happy ending—that’s up to you. But we’ve had some pretty impressive performance in the past. Just ask Alex and Kelly. Some years ago, their best man sent me a photo of the wedding. 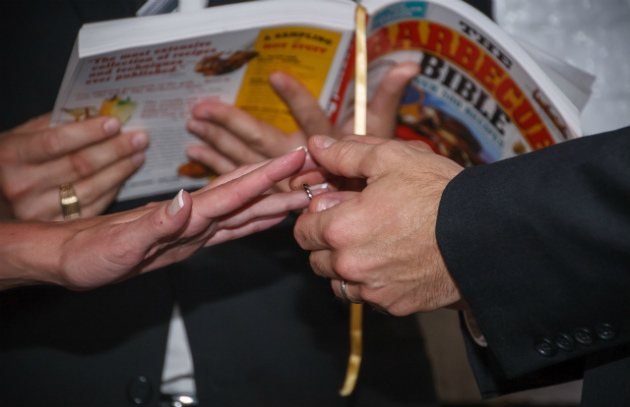 The holy book they swore their vows on? The Barbecue Bible. Post photos of YOUR romantic barbecue dinner on the Barbecue Board or Facebook, and if the menu, er, works, let us know!